Lovarzi is at the London Film and Comic Con this weekend, and we’ve teamed up to offer you 10% off when you buy two or more Doctor Who items from their stand. You can find Lovarzi on the ground floor of Olympia National – look out for the Fourth Doctor standee, wearing a scarf! 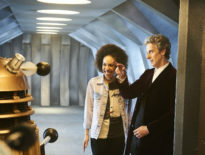 – and all you have to do is select two of more products from their Doctor Who range and show your smartphone, displaying this article, to anyone behind the Lovarzi stall. If you can’t get Internet in the Olympia, a screenshot will be acceptable, so come prepared! The company’s first Doctor Who officially-licensed item was the bestselling Fourth Doctor Scarf back in 2012, and the range has expanded to include the Fifth Doctor’s Sweater, the Seventh Doctor’s Jumper, the Fourth Doctor’s Season 18 Burgundy Scarf, and even a knitted Fourth Doctor tie! 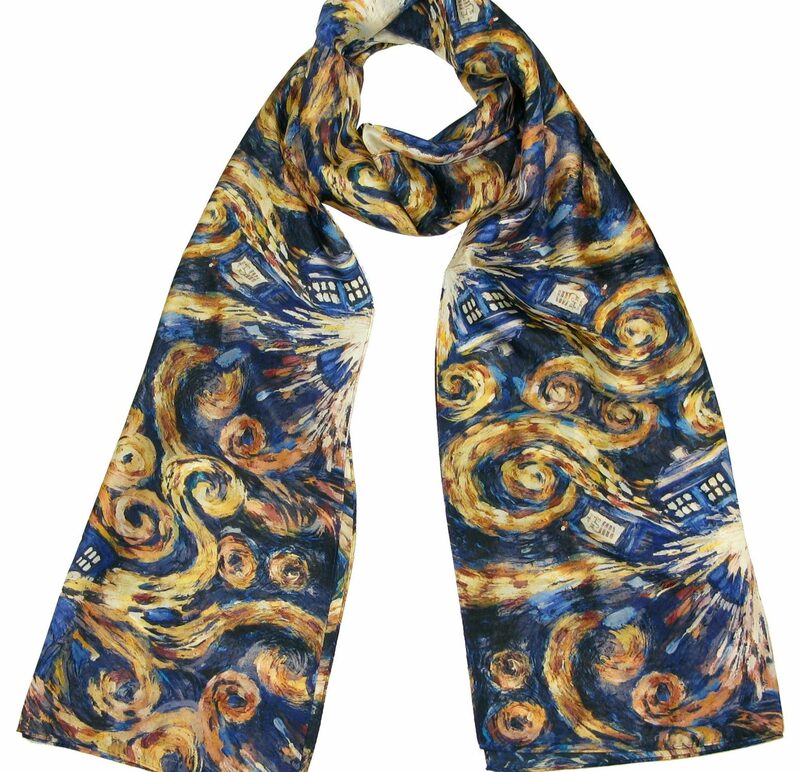 If you’re an Eleventh Doctor fan, you’ll love The Pandorica Opens Scarf, a 100% pure silk digitally-printed scarf emblazoned with the painting supposedly by Vincent van Gogh. If you’re a truly dedicated Fourth Doctor cosplayer, there’s a full-length 18ft Season 16/17 scarf available to wrap around you! And if it rains over the weekend, you could pick up either the TARDIS Stick Umbrella or the ‘Time Lord’ Folding Umbrella! On the Lovarzi stand, you’ll also see some Star Trek and Sherlock products, so it’s a perfect place to indulge in your passions. I expect there’s a high number of Who fans at the LFCC this weekend, as the guest list includes: Paul McGann (the Eighth Doctor); Sylvester McCoy (Seventh Doctor); Colin Baker (Sixth Doctor); Michelle Gomez (Missy); Faye Marsay (Last Christmas); Ben Aaronovitch (Remembrance of the Daleks; Battlefield); Frazer Hines (Jamie McCrimmon); Bonnie Langford (Mel Bush); Donald Sumpter (The Sea Devils; Hell Bent); Patrick Ness (Class); Rachael Stott (artist on Titan Comics’ Twelfth Doctor title); Dave Prowse (The Time Monster); Pip Torrens (Human Nature/ The Family of Blood); Jeremy Bulloch (The Time Warrior); Lee Sullivan (Doctor Who Magazine); Steven Berkoff (The Power of Three); Todd Nauck (cover artists for Titan Comics); and Roberta Tovey (Dr. Who and the Daleks; The Dalek Invasion of Earth 2150AD). If you’re heading to the convention this weekend, have a great time!